Steven Galbraith. Photo by Ryan Jenq. Thinking about the one-year anniversary of Manifold Greatness takes me back to August 2009 and a balcony overlooking the ocean at Bethany Beach, DE. Miles from the Folger, my mind was more in Margaritaville than Jacobean England, but I owed Hannibal Hamlin a phone call regarding the King James Bible. A few days earlier we had met with my Folger colleagues regarding plans for the KJV’s 400th anniversary. We agreed to co-curate a Folger exhibition in 2011, but as ideas flew around the room, the scope of the exhibition grew and grew. There was talk of partnerships, grants, websites, and traveling exhibitions. In some ways this is the most exciting moment in the life of an exhibition: the moment when you think as creatively as you can, without yet worrying about what might not be possible. The KJV anniversary was clearly going to be a bigger project than we had first imagined. I think that I can speak for both Hannibal and myself in admitting that although it was exciting, it was also pretty overwhelming. We agreed to talk everything through in a few days. I left the library for the beach. Fast forward to this past fall. Like Hannibal, who recently shared his reflections on the one-year anniversary of the exhibition, I was inspired by our meeting last fall with representatives from the exhibition’s host sites. As I stood before this amazing group of people and heard their plans for their exhibitions, it really dawned on me that the exhibition on which we all had been working was really about to launch. With the Folger Shakespeare Library, the NEH, and all of these dynamic librarians, curators, and educators putting their efforts behind the exhibition, I knew things could only go well. A year in and I am thrilled by the reach of Manifold Greatness. So far the exhibition has traveled to eighteen sites (counting the larger exhibitions at the Folger, the Bodleian Library at the University of Oxford, and the Harry Ransom Center at the University of Texas, Austin). The Folger exhibition broke previous attendance records and the turnout at the exhibition sites has been very impressive. We are so thankful for all the support. The blog itself has been visited 30,948 times. Thank you for reading! I couldn’t have seen any of this three years ago from my perch looking out over the ocean. When I did phone Hannibal we talked at length about how fun it was going to be to work together and agreed that we wouldn’t let things get too overwhelming. We were right on one count! But from my vantage point the future looked pretty promising. 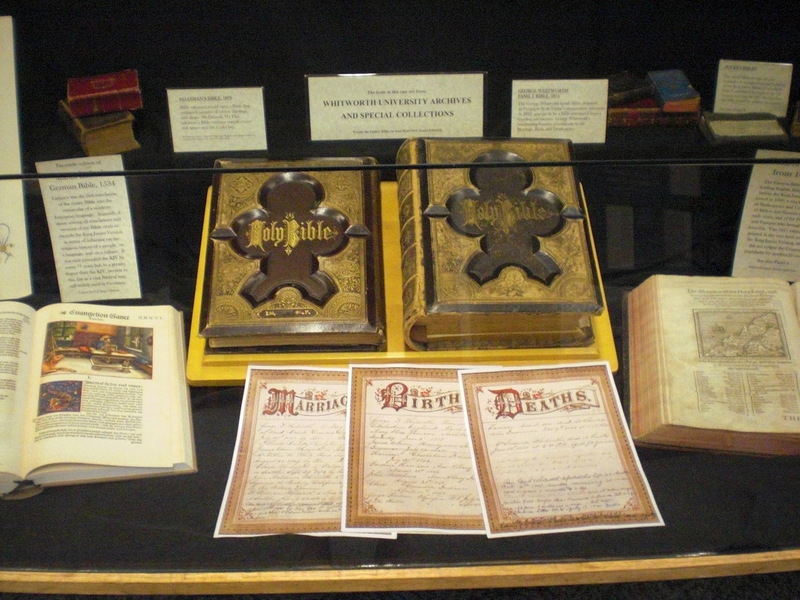 The Manifold Greatness exhibition at the Winfield Public Library displayed two rarely-seen pulpit Bibles, and these items drew considerable attention over the course of the exhibition. The Bibles are associated with two prominent men—Colonel Henry C. Loomis and John Peter “J.P.” Baden—who shaped the early history of Winfield, KS. Bible. Holman’s Edition, published by M.C. Lilley & Co. in Columbus, OH. On loan from the Winfield Masonic Lodge #110 the Free and Accepted Masons of Kansas. Image courtesy of Winfield Public Library. Born in Cattaraugus County, NY in 1834, Henry Loomis grew up in a farming family and inherited an interest in military life from his grandfather, a veteran of the Revolutionary War. At the outbreak of the Civil War, Loomis served in Company C., 64th N.Y. Infantry and was commissioned as a first lieutenant. At the Battle of Fair Oaks in June 1862, Lt. Loomis received severe wounds while leading his company in a charge against Confederates soldiers. Loomis was ordered home to convalesce, and during his recovery, he helped recruit and organize the 154th N.Y. Infantry. He eventually received a commission as a Lieutenant Colonel before leaving the Army and heading West. As he traveled westward in search of new opportunities, Loomis heard of a perspective opening of the Osage Indian Reservation in the new state of Kansas. Loomis found the valley near the Walnut River near present-day Winfield attractive, and paid the Osage chief $5.00 to stay on his squatter’s claim of 160 acres. Winfield now occupies 100 acres out of the original 160 settled by Henry Loomis. As one of the founders of the town, Loomis has been first and foremost in every enterprise that would build up and improve Winfield. Loomis helped organize the county, served as its first county clerk, became a member of the first board of trade, helped secure railroad lines through Cowley County, and served two terms as mayor in 1896. Loomis was made a Master Mason in 1862 and remained a member for forty-three years, advancing to the thirty-third or highest degree. He died in Winfield and is buried in the town’s Union-Graham Cemetery. 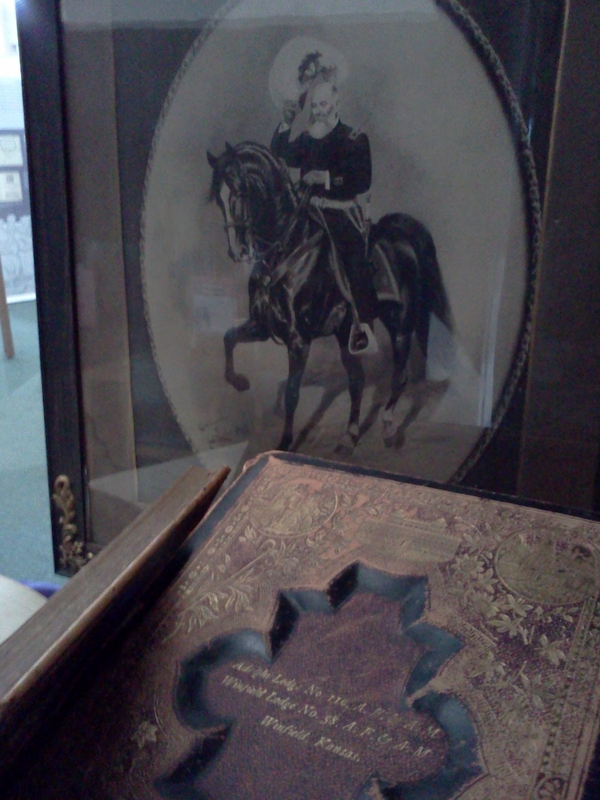 His copy of the King James Bible, along with a photograph of Loomis in his Templar uniform, was displayed. 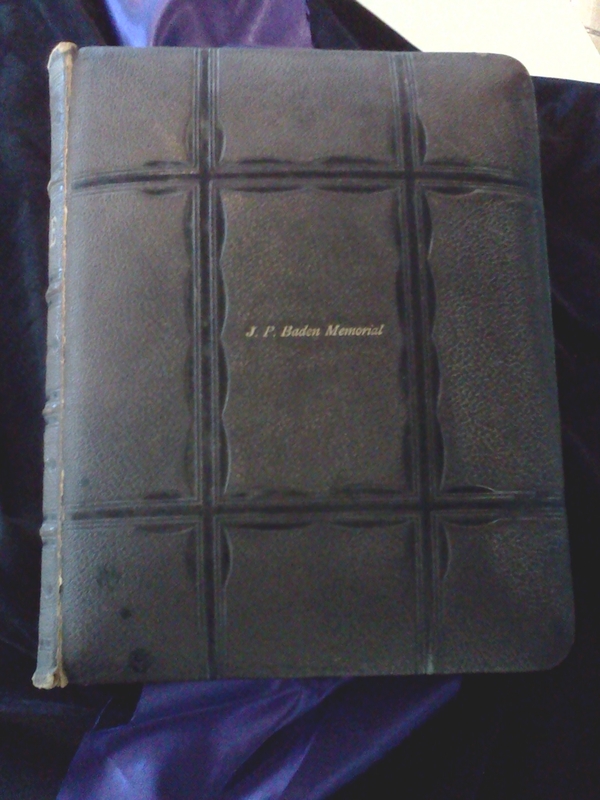 J.P. Baden Memorial Bible. Levant morocco- bound pulpit King James Bible presented to J.P. Baden Memorial Lutheran Church as a memorial to J. P Baden by his wife on January 28, 1906. On loan from Trinity Lutheran church in Winfield, KS. Image courtesy Winfield Public Library. John Peter Baden was born 1851 in Elsdorf, Germany. At the age of 15, he sailed on the Richard Reihe and landed in New York City in 1866. He went to live with his brother in Hannibal, MO to learn the English language and to become a United States citizen. After working and saving money, J.P., as he came to be know, traveled to Kansas and opened a business in Winfield in 1879. As a young entrepreneur, Baden operated a packing plant that became one of the largest in the West and handled the bulk of poultry, game, eggs, butter and produce of southern Kansas, Oklahoma, and what was then a part of the Indian Territory. He also owned an ice plant and cold storage facility, and a roller mill and elevator for processing grain. His business ventures proved very successful, as Baden possessed notable talent in making money while simultaneously leading a modest lifestyle. He poured his profits back into trade, stimulating business and giving work to the unemployed. J.P. Baden and his wife, Adelaide, brought the first Lutheran church services to Winfield and also established St. John’s College. 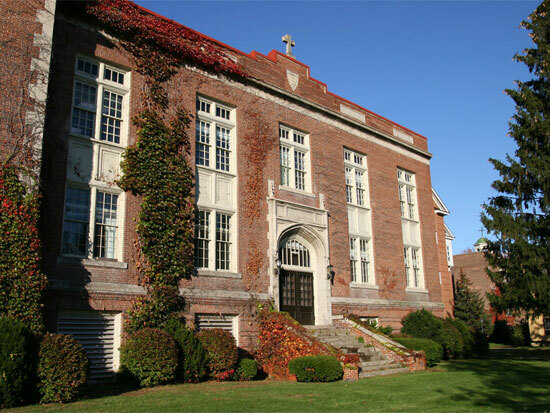 The college was founded in 1893 and was the first Evangelical Lutheran College of higher education to admit women. It operated for over a century before closing in 1986. The City of Winfield later purchased the St. John’s College site and renamed it Baden Square. The Winfield Public Library now occupies one of the buildings on Baden Square, and it seems fitting to display a Bible owned by the college’s founder on the very site that he played such a role in creating. Sue Birney is the Adult Special Services Librarian at Winfield Public Library in Winfield, KS. A display of Bibles, including one owned by George Whitworth, the founder of Whitworth University, and certificates for recording births, deaths, and marriages. Courtesy Whitworth University. As Whitworth University Library prepares to pack up the Manifold Greatness exhibit, we have the opportunity to reflect on the community support we have received. Our community partners, and the people who visited the exhibition, have truly made Manifold Greatness at Whitworth University a success! The Spokane County Library district , which partnered with Whitworth to promote the Manifold Greatness exhibition, hosted programs related to the Bible and Culture at two of their branch libraries. A speaker from Whitworth University asked for audience input about the Biblical themes portrayed in advertising. Audiences were surprised to learn that in some Jewish traditions, Cain is considered the son of Eve and the serpent (the serpent seed), rather than the son of Adam and Eve. This interpretation comes into play in an advertisement for Smirnoff Green Apple Twist, in which the serpent (a female) appears to be seducing Adam. Gonzaga University Library’s Special Collections contributed items for the Manifold Greatness exhibit room. 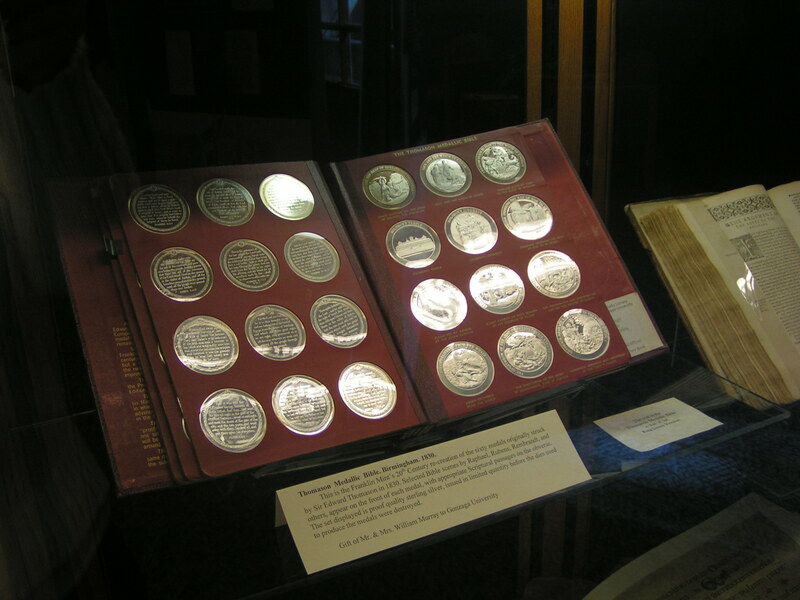 One such item is a Franklin Mint reproduction of the Thompson Medallic Bible, a group of 60 sterling silver medals depicting famous artists’ rendering of Biblical stories on one side and accompanying scripture (text from the King James Bible) on the other side. Reproduction of the Thompson Medallic Bible. Image courtesy of Whitworth University. 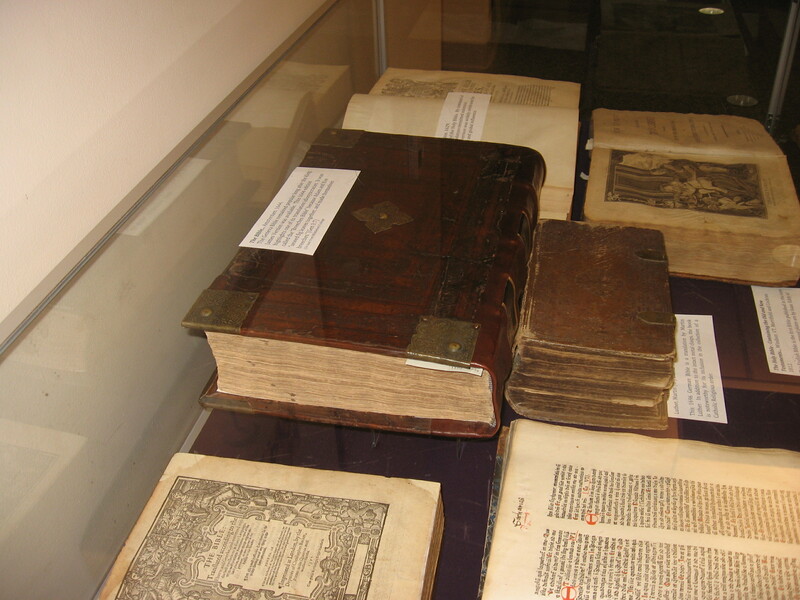 The Spokane Public Library’s Northwest History Room hosted a display entitled “Early Religious Texts,” showcasing a collection of rare Bibles, psalm books, and other religious tools and texts. The collection includes a 1475 transcript of Peter Lombard’s Four Books of Sentences, complete with chains to ensure it would not be stolen. The Four Books of Sentences was a classic theology textbook in medieval universities. 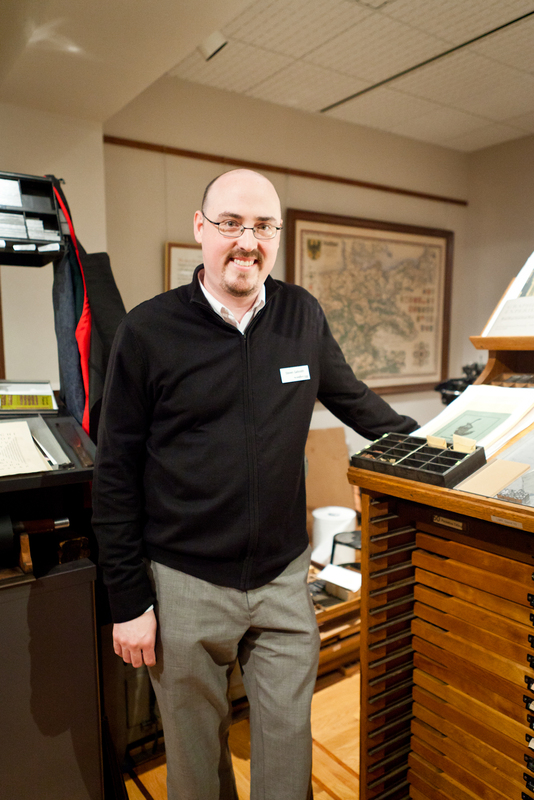 Whitworth University Library’s Special Collections displayed a Bible used by traveling salespeople to show customers the many customizable features available to them. There are sample covers and sample leather colors in addition to the illustrations, concordances, and other features included in the Bible. The Bible contains a ledger in which the salesperson can keep an accounting of the names of people who ordered a Bible and how much they agreed to pay. One of the sample covers matches the cover of a Bible owned by George Whitworth, the founder of Whitworth University. We have been fortunate to have church groups (some who traveled more than 100 miles! ), school groups, and retirement community groups view the exhibit and attend programs. This, of course, is in addition to the campus community, including faculty, staff, and students. The exhibition’s schedule gives Whitworth University an additional opportunity to reach a wider audience on the eve of Commencement with families of graduating students, alumni groups, and trustees also on campus. The exhibit is richer as a result of the community involvement and support we have received. Thank you to all who have contributed and spread the word about Manifold Greatness: The Creation and Afterlife of the King James Bible at Whitworth University! Whenever a librarian or curator begins working at a new library, he or she is given the overwhelming, though gratifying, challenge of getting to know the collection. When I was in library school, my advisor John Ellison gave me sound advice that when I start any new job to spend time afterhours and during breaks just browsing the stacks until I felt comfortable in my new surroundings. I’ve since made this a habit. 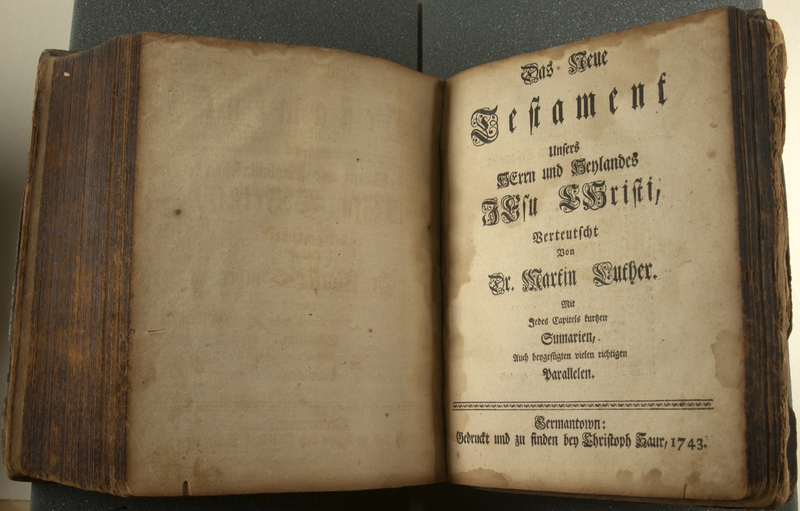 “Biblia, Das ist: Die Heilige Schrift Alten und Neuen Testaments, Nach der Deutschen Übersetzung D. Martin Luther”. Courtesy Rochester Institute of Technology. I happen to love books that are missing their binding material. Though they can be a challenge to handle, they are great examples to use when teaching bookbinding and the anatomy of books. 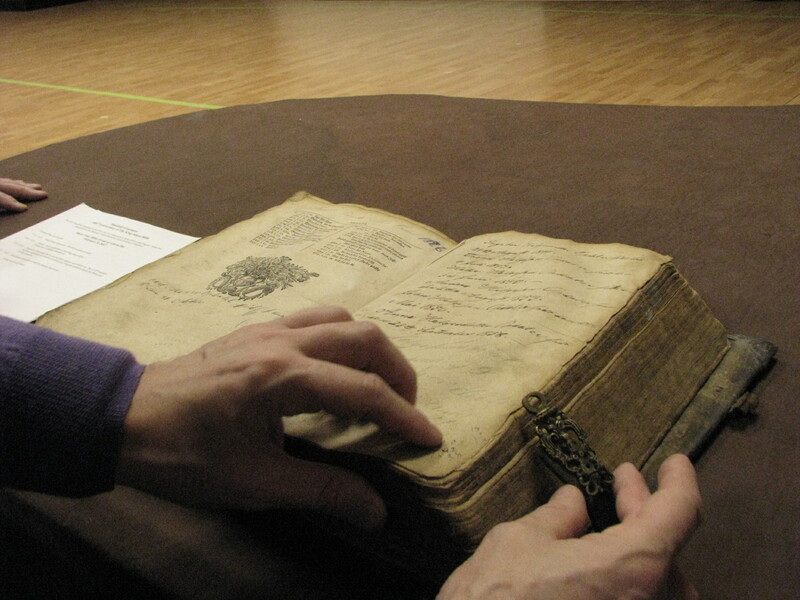 From a distance, the book looked early to me, perhaps sixteenth-century. When I opened it, however, I quickly realized it was a later German Bible. Its title page was missing (a common ailment in early Bibles), so I moved forward to the beginning of the New Testament, which often has its own title page. 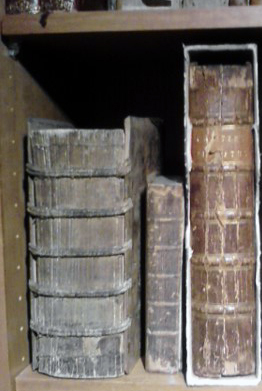 Printed in 1663 and 1782, respectively, these were the first and third Bibles printed in the United States. Both appeared in the Folger’s Manifold Greatness exhibition. The Sauer Bible could have as well. Historically, it rests between Eliot’s Massachusett Bible and Aitken’s “Revolutionary” Bible, as the second Bible printed in the United States and the first Bible printed in America in a European language. The Sauer Bible takes its name from Christoph Sauer, a German immigrant and printer in Germantown, PA who in 1743 sought to publish a Luther Bible in German for the waves of immigrants that were making their homes in Pennsylvania. When in the fall of 2013, the Cary Collection attempts its own Bible exhibition, this copy of the Sauer Bible will certainly be featured as an important artifact in the history of the Bible in America. For more on this topic, I would recommend Hannibal Hamlin’s essay “The King James Bible in America” from the Manifold Greatness exhibition catalog.